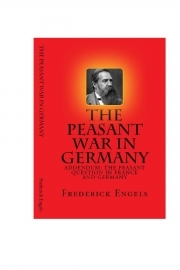 Description of "The Peasant War in Germany (eBook)"
Engels demonstrates the failure of both these revolutions was largely attributable to the bourgeois/burgerdom (and thus underscoring the modern need for an alliance between the working proletariat and the working peasantry). The Peasant War in Germany was the first history book to assert that the real motivating force behind the Reformation and 16th-century peasant war was socio-economic (class conflict) rather than “merely” religious. Engels' "The Peasant Question in France and Germany" was part of the current debate around agrarian issues. Engels wrote it as rebuttal to various French Socialists (like Vollmar) and the agrarian programme adopted in Marseilles in 1892 and supplemented in Nantes in 1894 (Frankfurt Congress of German Social-Democrats). In it, Engels discusses a policy of alliance between the working class and the working peasantry. It was penned between November 15-22, 1894 and first published in the journal Die Neue Zeit, Bd.1, No.10, 1894-95. Reviews of "The Peasant War in Germany (eBook)"